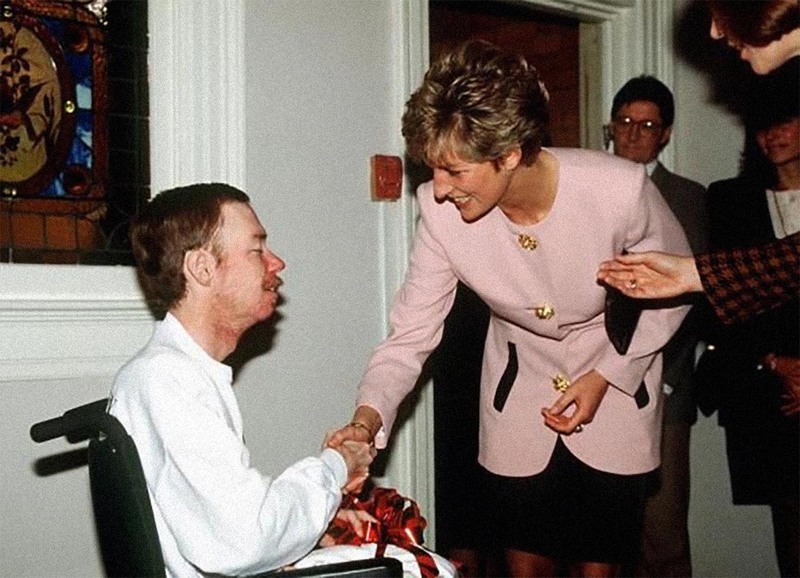 Princess Diana shaking hands with one of the residents of Casey House, an AIDS hospice, in Toronto, Canada. By the time of this photograph, AIDS might have been more widely understood, but people were still wary about how it was transmitted because it wasn’t widely understood by the general public at the time. Princess Diana was a very important figurehead in convincing people that merely touching AIDS victims was alright, and they wouldn’t die by shaking their hands. The princess was quoted as saying “HIV does not make people dangerous to know. You can shake their hands and give them a hug. Heaven knows they need it”. Diana would usually visit the ill or dying in hospices across the world in order to raise awareness for the diseases and compassion for those that were diseased. AIDS was first clinically observed in 1981 in the United States. The initial cases were a cluster of injecting drug users and homosexual men with no known cause of impaired immunity who showed symptoms of Pneumocystis carinii pneumonia (PCP), a rare opportunistic infection that was known to occur in people with very compromised immune systems. In the early days, the U.S. Centers for Disease Control and Prevention (CDC) did not have an official name for the disease, often referring to it by way of the diseases that were associated with it, for example, lymphadenopathy, the disease after which the discoverers of HIV originally named the virus. They also used Kaposi’s sarcoma and opportunistic infections, the name by which a task force had been set up in 1981. At one point, the CDC coined the phrase “the 4H disease”, since the syndrome seemed to affect heroin users, homosexuals, hemophiliacs, and Haitians. In the general press, the term “GRID”, which stood for gay-related immune deficiency, had been coined. However, after determining that AIDS was not isolated to the gay community, it was realized that the term GRID was misleading and the term AIDS was introduced at a meeting in July 1982. By September 1982 the CDC started referring to the disease as AIDS. The earliest well-documented case of HIV in a human dates back to 1959 in the Congo. In July 1960, in the wake its independence, the United Nations recruited Francophone experts and technicians from all over the world to assist in filling administrative gaps left by Belgium, who did not leave behind an African elite to run the country. By 1962, Haitians made up the second largest group of well-educated experts (out of the 48 national groups recruited), that totaled around 4500 in the country. Dr. Jacques Pépin, a Quebecer author of The Origins of AIDS, stipulates that Haiti was one of HIV’s entry points to the United States and that one of them may have carried HIV back across the Atlantic in the 1960s. Although, the virus may have been present in the United States as early as 1966, the vast majority of infections occurring outside sub-Saharan Africa (including the U.S.) can be traced back to a single unknown individual who became infected with HIV in Haiti and then brought the infection to the United States some time around 1969. (Photo credit: Getty Images, Tim Graham). So there were 100'000's if not millions of people dying of this heterosexual "wasting" virus in Africa & no one noticed a thing for 50 years + before landing on NYC gay district in 79. No one has ever explained this. HIV bares a striking resemblance to FeLV (cat aids). The first valid HIV cases (cluster) go back to 77, give the virus 2.5 years to manifest itself, you have the origin of the epidemic around 74/75. Di is always praised for this, but Barbara Bush did it 2 years earlier, not just shaking hands but hugging AIDS patients. Press doesn't report it much since she's not a liberal darling.